Thanks to Christine Kulstad for her help writing the Conference Notes this week! 2 complications of eczema: Ipetigo (superimposed infection ) Eczema herpeticum is a supra-infection of herpes of eczema lesions. 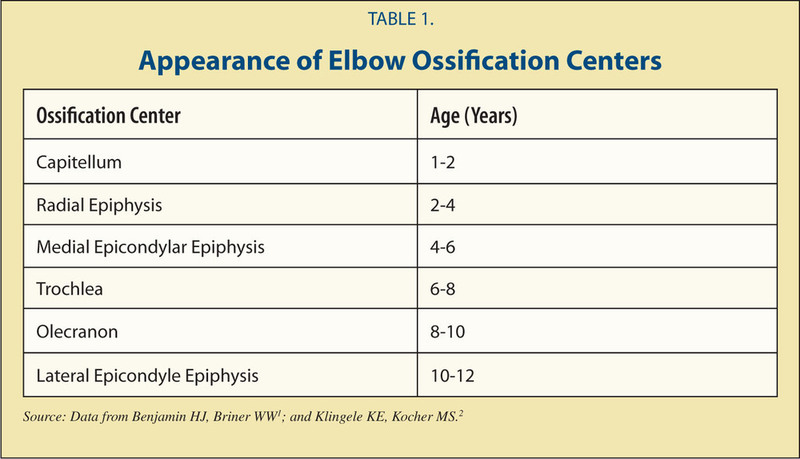 Mnemonic for ossification sites of pediatric elbow, CRITOE: Capitellum, Radial head, Internal (medial) Epicondyle, Trochlea, Olecranon, External (lateral) epicondyle. Girls ossify at 1,3,5,7,9,11 years. Boys ossify at 2,4,6,8,10,12. Any posterior fat pad on the elbow film is abnormal. Very prominent anterior fat pad is usually abnormal. 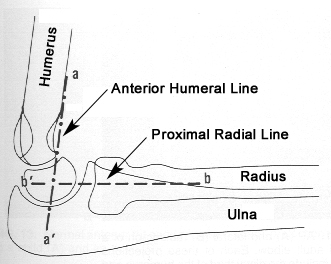 Anterior humeral line should bisect the middle portion of the capitellum. In general, Kids get supracondylar fractures and adults get radial head fractures. For kids with concussions: Harwood rule is minimum time off is 1 week for first concussion. 2nd concussion is 1 month off minimum. Saline, dextrose, hydrocortisone is the treatment cocktail for Congenital Adrenal Hyperplasia. Syncope mimics: basilar migraine, seizure, vertigo, hyperventilation, hypoglycemia, breath holding spell (6-18 month old child with tantrum or severe crying prior to syncope). Any hemophiliac with a head injury needs factor 8 ( 50u/kg) to get patient to 100% activity prior to any CT evaluation. If pt has a bleeding disorder and has mucosal bleeding, think Von Willebrand disease. Treat with topical aminocaproic acid, fibrin glue or tranexamic acid. Desmopressin works for Type 1 VB disease. The link in your head for boards is mucosal bleeding=Von Willebrand’s disease. Sickle cell disease markedly increases a child’s risk of stroke. The leading cause of death in a sickle cell patient is infection. They have functional asplenia. Also keep your guard up for acute chest syndrome in sickle cell patients with suspected pneumonia. Treat acute chest with antibiotics, transfuse for PO2 <70 or a decrease in O2 sat of 10%. They also need analgesics. No steroids for acute chest syndrome. Most important treatment for sickle cell pain crises is analgesics. IV fluids may increase risk of acute chest syndrome. These patients also have chronic pulmonary hypertension and cardiomyopathy so IV fluids can make matters worse. If the patient can drink, let them orally hydrate. If you feel they need IV fluids use small boluses of 10ml/kg and give maintenance rates. The concept of aggressive IV fluids for sickle cell pain crisis is kinda out. Buckle fractures are small bumps in the cortex of the bone in kids. They usually have a rapid recovery but they are fractures and need immobilization. Bowing fractures are a similar concept and are a bend in the bone. Greenstick fractures are another pediatric fracture with one cortex of the bone intact while the other cortex is fractured. Girzadas mnemonic is “ME” . Salter 1’s and 4’s are easy so this mnemonic doesn’t cover those. Salter 2’s and 3’s are the tough ones so ME just covers the 2’s and 3’s. Fracture line through the Metaphysis is a 2 and a fracture line through the Epiphysis is a 3. 20yo male with GSW’s to upper extremities. BP 120/80, HR=60. GCS=15. Within 10 minutes heart rate increased to 90, O2 sat decreased to 95% and voltage decreased on monitor. Breath sounds were noted to be decreased on the left side. Upright CXR has 52% sensitivity for pneumothorax. Ultrasound has 88% sensitivity for pneumothorax. Beware COPD and subQ emphysema can make identifying pneumothorax with U/S more difficult. COPD can look like a pneumothorax on ultrasound. Indications for acute decompression of tension pneumothorax are: respiratory distress, hypotension, and/or altered mental status. Low voltage on cardiac monitor or EKG can be indicative of tension pneumothorax or pericardial fluid/tamponade. To decompress a pneumothorax, place a long, large needle in 2nd intercostal space at mid-clavicular line. Follow that up with a chest tube. In this case, Chest tube drained 1200ml of blood. CXR showed a bullet in the right hemithorax. The patient had no bullet wound on chest wall. The bullet actually travelled up the arm and ricocheted into the chest through the axilla. (Weird) Salzman comment: When placing a chest tube for hemothorax, direct chest tube to inferior portion of lung to drain as much blood as possible. Management of hemothorax: Patient goes to the OR for 1500ml chest tube drainage over 24 hours. They go to the OR for a retained hemothorax after chest tube. Salzman comment: Taking the patient to surgery is a multi-factorial clinical decision. This is consistent with the EAST guidelines which state the physiologic status of the patient is more important than strict numbers when deciding to go for thoracotomy. Other authors state that ongoing chest tube drainage of 200ml/hr is an indication for thoracotomy as well. Ongoing chest tube drainage may be more important than the initial output. Pulmonary contusion/Flail chest management: Avoid fluid overload, mechanical ventilation only for respiratory failure, non-invasive ventilation is useful, pain control is important, and don’t use steroids and don’t use diuretics. Salzman comment: pulmonary contusions evolve over the first 24 hours. 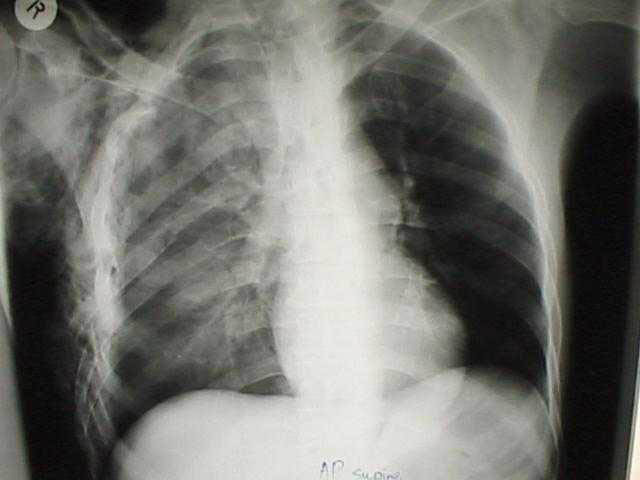 If the patient’s initial CXR shows signs of pulmonary contusion they are at great risk for rapid/severe deterioration. Some patients will require oscillator ventilation or ECMO. This limits the utility of non-invasive ventilation. Harwood comment: Are there lesser pulmonary contusions that can be managed with non-invasive ventilation. Salzman reply: Younger patients who develop pulmonary contusion on CXR after 24 hours post-injury who need a little support may get by with non-invasive ventilation. Salzman comment: If you suspect a pneumothorax, don’t hesitate to place a chest tube. On the other hand, Many pre-hospital needle decompressions don’t get into the chest cavity. So before putting in a chest tube in these patients in the ED get a chest xray first if they are stable to see if they have a pneumothorax prior to placing a chest tube. Case 1. Patient with metastatic lung cancer and COPD who is having respiratory distress. Patient was determined to have decisional capacity and refused intubation. Patient died in ED. Patient’s family later sued physician for not intubating her. Lesson: It’s the family who sues you, not the dead person. Case 2. Elederly patient in NH who is unresponsive and is pulseless and non-breathing. POLST form is the new State DNR form. It is more complicated and has more nuanced choices. There is concern that the form is more prone to mistakes. Case 3. Patient presents to ED in extremis. Patient has multiple chronic illnesses Power of Attorney is the patient’s designate who has power to make healthcare decisions. The Power of Attorney can contradict the DNR form. Case 4. Patient with severe Intracranial hemorrhage and posturing. Husband wants her extubated so that she can die comfortably. He doesn’t want her on a ventilator. There is a Withdrawal /Withholding Care Form you can use to withdraw care. Two physicians have to certify that patient has an irreversible condition. Case 5. 86yo female with respiratory failure. Family members disagree about who has decision making authority and POA. The standard for physicians is that a good faith effort was made by the physician to identify who is the Power of Attorney or proper family decision maker. You may have to ask a family member to bring in the Power of Attorney form to identify who has decision-making authority. Principal of double effect: An action has 2 effects, one is desired and one is accepted. All major religions endorse this concept. Case 6: 62yo female with Down Syndrome is in severe respiratory distress. NH paper work has a valid DNR and hospice paperwork. Hospice patients will sometime be brought to the ED if their symptoms can’t be controlled by hospice staff. We have a comfort care power plan in First Net that has suggested treatments for palliative care. What does hospice mean? 3 aspects: 1. Approach to end of life care, 2. type of facility, and 3. insurance designation. Physician certifies that patient has less than 6 months to live. Case 8. 45yo male with metastatic cancer sent to ED for hypoxia/tachycardia. He has decisional capacity and asked to be discharged. Wife agrees to the discharge. Hospice care was initiated while in ED. You have to fill out a DNR form. Case 9. 101yo male presents to triage with minimal vital signs. Patient is resuscitated. After speaking with patient’s daughter, care was withdrawn. Patient died in the hospital. Susceptible with a number (8 mcg/ml) means close to line between resistance and susceptibility. Be careful, go towards higher dosing ranges or more frequent dosing intervals. Or choose a different medication with < susceptibility reported. We’re concerned for ionizing radiation- alpha, beta, neutrons, xrays, gamma. Alpha can’t penetrate skin but can cause trouble if ingested. Beta- protected if wearing clothes or aluminum foil. Acute radiation syndrome- usually requires 2 grays (equivalent to 20,000 simultaneous CXR’s). Onset of symptoms is dose dependent. Present with anorexia, nausea, vomiting, hypotension, pyrexia in prodromal phase. Treat symptomatically. Prodromal phase followed by latent phase (symptom free interval). Latent phase is missing in very large exposures. Hematopoietic syndrome- pancytopenia is the main issue. Infection or bleeding is the problem. Survival is possible. Deaths occur in a few months. Blood transfusions, stem-cell transfusions may help. If symptoms rapidly apparent or rapidly progressive, comfort care only. Hospital- assume the patient is contaminated unless you know they are decontaminated.